Jason Hooten is the new head coach of the men's basketball team. Jason Hooten, assistant coach for Sam Houston State the past six years, has been named as the Bearkats' new head men's basketball coach, Director of Athletics Bobby Williams announced Friday. Hooten succeeds Bob Marlin who coached the Kats to a 225-131 record the past 12 seasons. Marlin now is head coach at the University of Louisiana at Lafayette. Hooten was introduced to area media and the university community at a news conference Monday at noon at the Ron Mafrige Field House at Bowers Stadium in Huntsville. In his six seasons with the Bearkats, Hooten has helped direct the program to a 127-59 record, four 20-plus victory seasons, Southland Conference regular season and tournament championships and an NCAA tournament appearance in 2010. "As we began to look at candidates for our head men's basketball coaching position, the support for Jason Hooten from team members, supporters close to the program, university administration and athletic department internal staff was overwhelming," Williams said. "Jason has been an integral part of our men's basketball program, the most successful in our conference over the past 12 years. With Jason as our head coach, the transition period will be much easier. This is an exciting day for Sam Houston State." The 25-8 record for Sam Houston in 2009-10 marks the highest victory total for a Bearkat squad in SHSU's 23 seasons at the NCAA Division I level. Sam Houston stands as one of only 52 programs out of the 340 teams in Division I basketball that have posted 20 or more wins four of the last five years. Among those 52 teams, the Kats have the 28th-best winning percentage. "This is an exciting day for my family and me," Hooten said. "I want to thank President James Gaertner and Bobby Williams for this opportunity. Sam Houston is a great place to be. I'm also grateful to Bob Marlin for hiring me as an assistant six years ago. Bob gave me the opportunity to mature as a coach and to work with outstanding student-athletes in a quality academic environment." Hooten joined the SHSU staff July 1, 2004, helping run practice, recruiting, scouting, scheduling and academics. In 2009, RecruitingRumors.com selected Hooten as one of the top 100 NCAA assistant coaches. 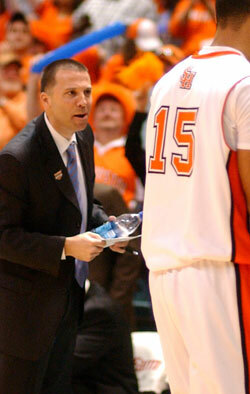 Last July, CollegeInsider.com named him Mid-Major Top 25 assistant coaches honorable mention. "Knowing the outstanding coaches who have contacted Bobby Williams interested in this job, it feels even better to see that the administration here has confidence in our ability to continue the success of this program," Hooten said. "Now it's time to hit the ground running. We have an outstanding group of eight players returning from the championship squad plus three signees. We will continue to recruit the quality young men like those who have come here and built Sam Houston basketball into a program that is successful both athletically and academically." Previously, Hooten served as assistant men's basketball coach at Tarleton State University for Lonn Reisman. During his tenure, the Texans posted a combined 204-111 record. Hooten also played basketball at Tarleton, helping lead the Texans to a 52-10 mark. He returned to Tarleton in August 1993 after serving as a part-time assistant coach at Weatherford Junior College. Hooten assisted in all aspects of the men's basketball program, with particular emphasis in recruiting and scheduling. Hooten's recruiting efforts played a key role in Tarleton's amazing 82-16 overall record his final three seasons with the Texans. In 2004, Tarleton posted a 28-4 record and claimed both the Lone Star Conference North Division title and the LSC Championship. The Texans won back-to-back North Division championships with a 29-4 record in 2002-03 and a 25-8 mark in 2001-02. During Hooten's 11 seasons with the Texans, nine players earned first team All-LSC honors and five were All-America. Hooten also coached and recruited Tim Burnette who was named Texas Association of Basketball Coaches Small College Player of the Year in 2004. Hooten played two years at McLennan Community College, where he was an honorable mention all-conference selection and led his team to a league title. At Tarleton, he earned two letters under Reisman, helping the Texans to a pair of 26-5 records and TIAA titles. A 1987 graduate of Killeen Ellison High School, Hooten lettered in basketball and baseball. He earned all-district, All-CenTex and All-Super CenTex while leading his team to the bi-district championship as a senior. He holds school career records for scoring and assists. In baseball, he twice earned All-District honorable mention and lettered three years. Hooten holds two degrees from Tarleton State, earning a bachelor's in exercise and sport studies in 1993 and a master's in 1995. He is married to the former Kristen Miller. The pair have a daughter, Jadyn, and a newborn son Jayce.